I love celebrations! Especially when it involves my family or myself, either being the intended target or getting to help put the celebration on in some way. Call me selfish, call me self-absorbed but celebrations and finding ways to reward yourself are infinitely better when you have a personal stake in it. Like the time my wife surprised me for my 25th birthday. We went out for dinner with another couple and came back to our apartment to have some coffee and play cards. I opened the front door to the dark apartment and was greeted with lights flipping on, the popping of balloons (which I thought were gunshots) and shouts of “Surprise!” from a dozen or so of our friends from church. The momentary shock contorted my face and caused me to curl my body into the fetal position. I posed like Lee Harvey Oswald being struck by Jack Ruby’s bullet. Parties are great for significant birthdays, anniversaries, graduations and weddings. But we shouldn’t limit their usage to just those occasions. Perhaps the best time to throw a victory celebration is when you have achieved some personal goal in your life. The Luke1428 household reached a milestone last month that we’ve been working on for three years and boy, did we have a blast celebrating it this past Saturday night. The cool thing about this journey is that each member of the family has pitched in to help. I laid down my job as principal of our school to go back into the classroom to teach, thus lessening my responsibilities at work. I retired my basketball coach’s whistle to be the dad who watches over after school homework sessions and prepares dinner. I traded in weekend sessions on the couch watching football all day for laundry, cleaning bathrooms and doing the grocery shopping. Our kids have just been awesome. The older two (now 10 and 12) have grown up right before our eyes and become “little parents” to the younger two. They clean house, empty trash, load and unload the dishwasher, scrub bathrooms, cook some of their own meals, and do their own laundry. The youngest two (5 and 7) have also learned to help by washing down house railings, cleaning their rooms, packing their own lunches for school, and taking care of the two dogs. What a load they have taken off our shoulders! I don’t want to fool anyone into thinking this has been easy. In fact, Mrs. Luke1428 and I agree it’s the hardest thing we’ve ever done in our marriage. We’ve sacrificed a lot and so have our kids. Mommy wasn’t always available during the busy tax season. She couldn’t stop in the middle of an on-line test taking session to bandage a skinned knee. She had to study when I would have rather watched a movie with her or gone out to dinner with our friends. There have been other sacrifices to that I’m not ready to share. Needless to say, it was rough at times. Looking back though, it was all worth it so my wife could pursue her dream. Our promise to the kids for months was that when the license came we would get all fancied up in our best dress clothes and go to an upscale restaurant called the Sundial. 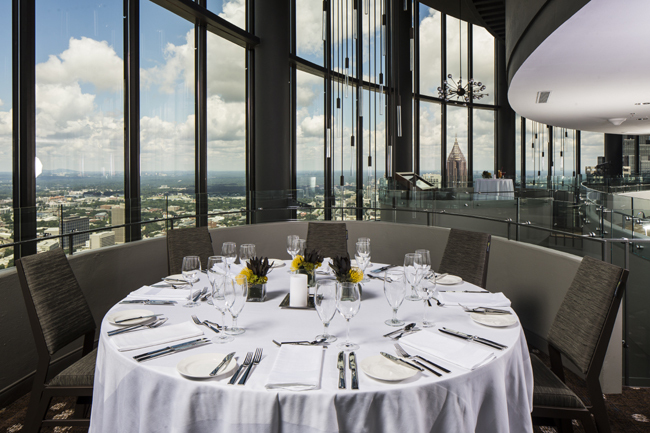 This restaurant is positioned on the top floor of the Westin Hotel in downtown Atlanta. 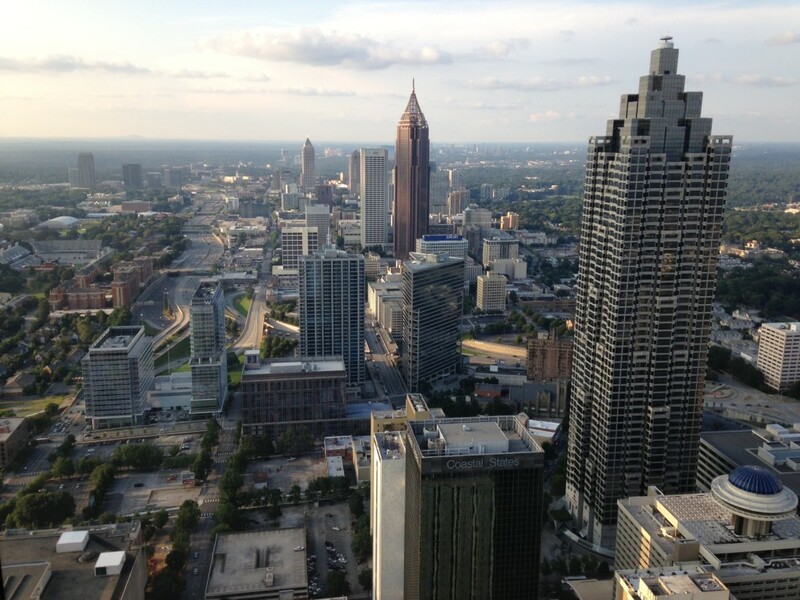 The walls are glass windows so you can see the skyline of Atlanta, the setting of the sun on the horizon and the bright lights of the city after dark. It’s called the Sundial because the restaurant floor moves in a circle, making one full rotation in an hour. Watching our kids step into the all glass elevator that ascends on the outside of the building and then move slowly into the restaurant, you would have thought we had entered a palace only suitable for kings and queens. Their eyes lit up with excitement as they watched the floor move, spotted Centennial Olympic Park far below and used the telescopes to zoom in on Turner Field. They would have been satisfied exploring the restaurant all night. I know you are thinking this sounds like the type of place where the meals aren’t cheap and you aren’t served a huge portion. You would be right on both accounts. The appetizers were more expensive than most entrees at a mid-level steakhouse. After appetizers, entrees, deserts and tips were factored in for the six of us, it ended up being the most expensive dinner I’d ever paid for. Mark the special milestones in your life with a celebration. It will provide a great memory and serve as a marker you will always remember. What cool things have you done to celebrate special achievements/milestones/goals in your life? 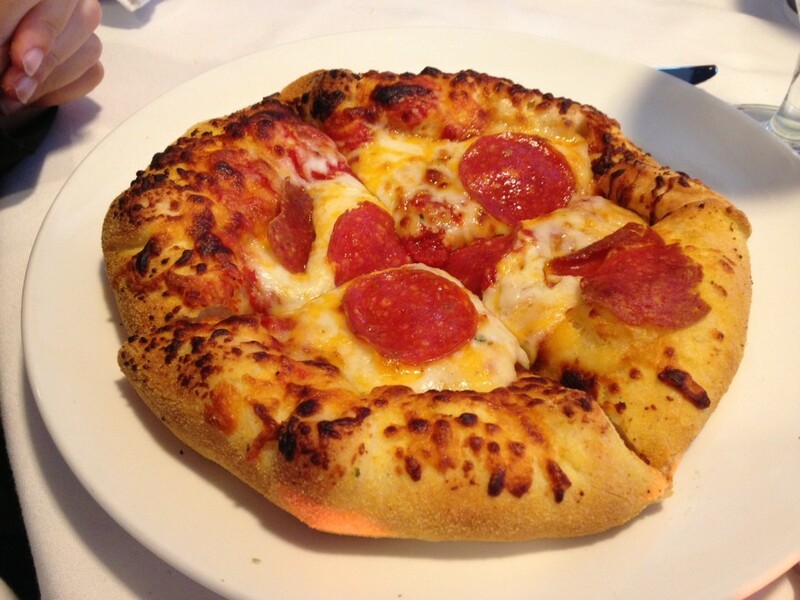 Bubs and Doot-Doot (my 10-yr. and 5-yr. old sons) – Go to one of the fancier restaurants in Atlanta and they order personal size pepperoni and cheese pizzas. Make of the cars being pulled up by the valet service for customers waiting to leave the restaurant: Mercedes, Lexus, two-seater BMW convertible, our Toyota mini-van. When we returned home late that night, we discovered the valet had left someone’s keys in our van. Oops! They sent someone 35 minutes to our house to pick up the keys we placed in our mailbox. After an exhausting night out with four kids, we were going to bed! Questions: How do you find ways to reward yourself when you accomplish something great? Next Post: If You Had One Wish, Would It Be For Money? I hope you enjoyed that post. Want more? Privacy Guarantee: I will not share your email with anyone. For my day job, I'm a high school government and economics teacher and school counselor at a private Christian school. In my off hours, I love collecting baseball cards, running my rental real estate properties, going on vacations with my four kids and hearing my wife talk about all the cool things CPAs do at work. You can connect with me on Facebook, Twitter and Google+. Huge congrats to Mrs. Luke, an accomplishment like that deserves a huge celebration! The post script is adorable! Those were really funny moments at the restaurant. Especially when my 7-year old daughter challenged her 5-year old brother to eat the crust so as not to waste money. That was a classic we will be telling for years! Big congrats to your wife on the CPA! I love how everyone pitched in and made it such a fun experience to celebrate her accomplishment. We did something similar after both of us getting our Masters and MBA, but we were kid-less then. I don’t know that we could do it now. Ah…I remember the kid-less days. I kind of forget what it was like to drop everything on a Saturday evening and go out with your friends until 2 in the morning. That ain’t happening now! Congrats to your wife on the CPA! I have friends who have taken that and it seems like a rough road to completion. She definitely deserved to celebrate! It was pretty rough DC! One of the hardest professional examinations out there. It has to be though. Who wants someone unqualified working in this area? Congrats to the Mrs! The CPA test is no joke – what an accomplishment! And I love that your whole family helped out when she was busy studying. You all definitely deserved a wonderful night out! She studied more for that test than anything I’d ever seen. Easily 25-30 hrs. a week, at nights and on the weekends. She bought a study course and even listened to audio teaching files in the car on the way to and from work. But it all paid off…she passed each of the four sections on the first try. On the first try?! Whoa, that’s amazing! Congrats again! I think one of the things that helped her accomplish this was the fact that she was working at an accounting firm for two years while she was at the same time studying for the exam. This allowed her to get real world experience so many of the topics she was studying came to her easier. That’s great! I have a friend who is the opposite – he’s worked at a public accounting firm while trying to study, and although he’s gained experience, he barely had time to study! whoo hoo! Congrats to Mrs. Luke!!! I think that’s great you treated the family to a fancy night out. It was well deserved! We’ve never done anything quite like that before, mostly because our youngest were too little to really appreciate it. They had quite a fun time. Congratulations to Mrs Luke 1428 on being a newly minted CPA! What an accomplishment! That’s awesome how everyone pitched in and supported her dream. I think it’s great that you celebrated in a super fancy restaurant! It is important to acknowledge these once in a lifetime moments and it’s something your family won’t forget. They are already talking about the next time we can go back! “Yikes,” my budget says. Sounds like a great time was had by all! Your children sound so sweet to be helping out with all the chores. That pizza looks really good actually, so I can’t disagree with their choice! Celebrating milestones is a great thing, plus you budgeted and planned for it. It gave you something to look forward to once your wife obtained her license. I can’t imagine how difficult it must have been, but I’m sure it was worth it! I haven’t really had anything come up, but my boyfriend and I will probably do a little weekend getaway thing for our 2 year anniversary sometime in Oct. The kids have really stepped up. I’m really proud of their efforts but more importantly I’m really proud of the positive attitudes they show. There really has been no negativity coming from them about what they have been asked to do. Our youngest actually was asking for mac and cheese but it wasn’t on the menu. So he had to settle for the cheese pizza. And he did end up eating the crust. Huge congratulations to your wife for getting her license. Nice work on doing what you could to help her through the process and succeeding. That is quite the story. Thanks Grayson! There is a lot more we are going to write about at some point in the future. It was really crazy from the first time we started thinking about it to how all the pieces fell in place along the way. There were surprises, twists and turns, and some really tough decisions along the way. Great story, and congrats to your wife for accomplishing that! I know my wife would love to get her masters one day, when our kids are a little older. You’re absolutely right, it’s important to celebrate major accomplishments like this. I sometimes have trouble deciding which events to celebrate since we are sacrificing financially to pursue our goals, but all celebrations don’t have to be expensive, they just need to be memorable. The upscale dinner sounds like a great experience for your kids. I could see how it would be tough to be financially sacrificing and hold a celebration at the same time. But it could be on a much smaller scale like you said. We actually did this as we went through the journey. We did something special (on a lesser scale) each time she passed a portion of the exam. That really helped spur her on to the next thing. How incredible that you “downsized” from Principal to teacher! As a former Superintendent, I commend you. The time with your kids was worth it I’m sure. The best part: Your family seems to be one tight unit. That was an interesting move Tony, one that I think many people didn’t quite understand. I’m going to write about it one day because it’s a story about sacrifice and taking a step back in order to take a step forward. Sounds like an awesome, and well-deserved, experience. I’ve been to a similar kind of restaurant here in Boston for special occasions, and I’m right there with you that experiences like this can be a lot of fun and worth the cost when done in the right context. Life is worth enjoying and when your money can help you do that, you should go for it, especially for something as worthwhile as celebrating all of the hard work your family put in. Congratulations to your wife and I can’t wait to hear more about how you guys move forward. Thanks Matt. I agree 100% that life is worth enjoying. Not an all out hedonistic type of enjoying where we seek every pleasure on every whim. But we can and should have fun and enjoy the journey along the way. Life is such a blessing and when we can use our money to create lasting memories I think it’s worth it. Saving Money Is Where It All Begins! "99 Ways to Spend Less and Save More"
Sign up to receive my blog posts via email and get 99 practical ideas that will jump-start your journey to financial freedom.